Vilnius, Lithuania – February 23, 2015 – Neurotechnology, a provider of high-precision biometric, robotics, AI and computer vision technologies, today introduced the SentiSculpt Software Development Kit (SDK) for the creation of 3D object models. With the broad availability of 3D printers and software for virtual reality, gaming, architecture and design applications, one of the biggest challenges has been the capture of 3D objects. This has either required expensive, specialized photographic equipment or the drawing of complex object meshes and wireframes. 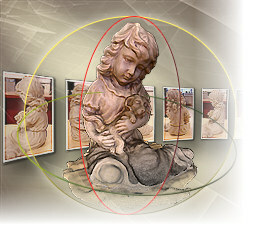 SentiSculpt SDK offers an alternative: the capture of real objects in 3D using off-the-shelf cameras or smartphones. SentiSculpt uses an advanced algorithm to turn a series of 2D photos into a 3D object model that can be used for 3D printing or in a variety of software applications. SentiSculpt SDK enables developers, designers, animators and integrators to easily incorporate 3D technology into their designs, software, games and other solutions that require realistic, virtual environments. "SentiSculpt brings users a higher visual experience - instead of looking through a series of static, 2D images people can navigate around objects within a 3D environment," said Dr. Vilius Matiukas, SentiSculpt project lead for Neurotechnology. "It is an excellent opportunity for sculptors to present their work, even make virtual galleries. And for application developers, all of this can be easily integrated in to their own projects with only a few lines of the code," Dr. Matiukas added. SentiSculpt SDK and the entire line of Neurotechnology products for AI, robotics, object recognition and biometric identification are available through Neurotechnology or from distributors worldwide. For more information, go to www.neurotechnology.com.